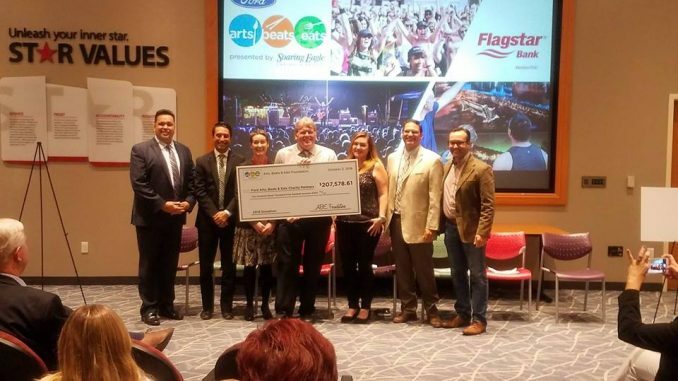 ROYAL OAK, Mich. – Ford Arts, Beats & Eats presented by Soaring Eagle Casino & Resort today announced that $207,578 was raised from gate admission, beverage proceeds and other festival sponsored community initiatives. The money raised during the 2018 Ford Arts, Beats & Eats has pushed the total giving since the festival’s inception to over $5.2 million. The donations were handed out this afternoon at a special media event at Flagstar Bank corporate headquarters in Troy. Flagstar served as the official bank sponsor for the 2018 festival, supporting additional cultural opportunities through its Flagstar Culture on 4th at Ford Arts, Beats & Eats. All proceeds for local charities were generated from attendance and programming for the Labor Day weekend event. In addition to monetary donations, Ford Arts, Beats & Eats and Downtown Royal Oak restaurants supported local shelters through Kroger’s Zero Hunger Zero Waste Program. Volunteers from Forgotten Harvest partnered with the Arts, Beats & Eats team and 3,120 pounds of food was rescued and distributed out into the community. Continuing its commitment to quality of life in the community, Ford Arts, Beats & Eats again teamed with Autism Alliance of Michigan for the 7th annual Family Days. Presented by new sponsor Delta Dental, its support made it possible to provide 2,350 children on the autism spectrum and their family members with a complimentary day of fun and entertainment, which included parking, lunch and unlimited carnival rides. Also, the 8th annual food drive hosted by Flagstar Bank benefitting Gleaners Community Food Bank of Southeastern Michigan collected 4,210 lbs. of food, which will provide more than 3,494 meals to those in need. Royal Oak Football Team, Inc. The City of Royal Oak paid $6,000 in donations to nonprofit organizations that supportedparking operations. Fitness classes from Life Time Fitness, as well as the Priority Health Practice for a Purpose Yoga Classes and the returning Priority Health Zumbathon generated nearly $20,0000 for Haven, Life Time Foundation, Paws for Cause and the Chika Fund. Charities in Royal Oak received a total of $82,889.54 from the festival this year. The sponsors for the 2018 Ford Arts, Beats & Eats include: Ford, Southeast Metro Detroit Ford Dealers, Soaring Eagle Casino & Resort, Ace & Sons, All Weather Seal, Bacardi, Barefoot Winery, Beaumont Hospital, Campbell Urgent Care, City of Royal Oak/DDA, Comcast, Deering’s Jerky, Detroit Shirt Company, DIA, DTE Energy, Entercom, Everdry, Famous Dave’s, Flagstar Bank, Hanson’s Windows, Hawthorn Suites, Hilton Garden Inn of Troy, Imperial Beverage, Kroger, Leaf Filter, Life Time, Light RX, M1 Studios, Made in Detroit, Majic Window, MetroPCS, Michigan Lottery, Milo’s Tea Company, Oakland County, Oakland County Board of Commissioners, Oakland County Parks, Oakland Community College, One Magnify, Outlaw Energy Drink, Pepsi, Priority Health, Renewal by Andersen, Sahale Snacks, Sprint, Sylvania Automotive, Tito’s Vodka, Traverse City Whiskey, US Park, Weatherguard Windows, and WindowPro. The 21st annual Ford Arts, Beats & Eats presented by Soaring Eagle Casino & Resort, is Oakland County’s premier festival held August 31-September 3, 2018. The festival paints downtown Royal Oak with a variety of art, food and music for the community to enjoy. More than 330,000 visitors attended the 2018 Ford Arts, Beats & Eats. “LIKE” artsbeatseats on Facebook or follow us on Twitter @artsbeatseats. For additional public information, visit www.artsbeatseats.com or call 248-541-7550.